And so we are ready to begin. 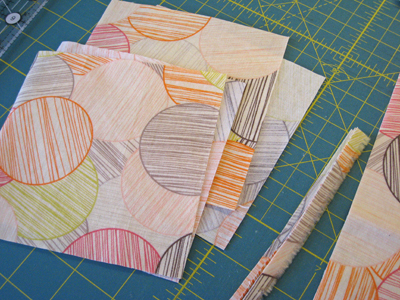 Generally speaking, we’ll follow the instructions to make the First Timer Table Topper. In her post, Karen mentioned an online tutorial about cutting, and while I agree with most of the information in that post, I follow a slightly different technique for some parts. You’ll see the differences as we go along. 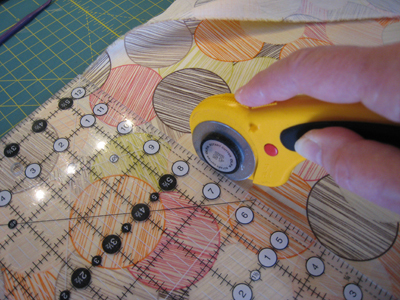 Here’s the thing, with quilting, there are about as many ways to do things as there are quilters doing them, so try new methods as you are introduced to them, and pick the ones that feel most comfortable to you. What’s all the fuss about cutting, anyway? Pretty much, most traditional quilts begin by making blocks. Then the blocks get sewn together in rows, sometimes with sashing strips in between, sometimes not. Blocks can be pieced (carefully cut pieces are sewn together with a 1/4″ seam allowance) or appliqued (fabric shapes are sewn on top of a plain piece of fabric), or a combination of pieced and appliqued techniques. 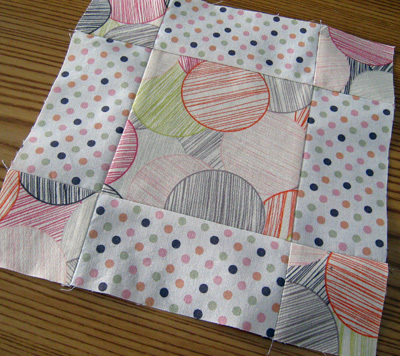 We’ll be focusing on an easy pieced block to start. But when you go to sew your blocks together and the pieces don’t fit, it often can come back to cutting that is slightly less than accurate. Find a good place to cut with nice lighting. The kitchen counter can be a perfect spot to get started. It’s usually the perfect height to stand and cut. (Better to stand than sit to cut.) You want to try to avoid long cutting session where you are bending over a shorter table. Your back will thank you! So, clear a spot, put your cutting mat in place, and let’s get started. 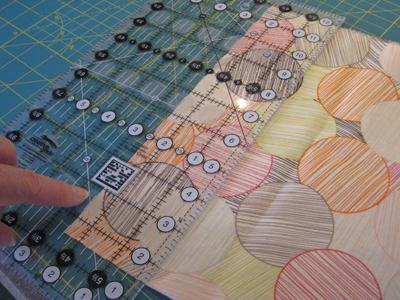 Don’t use the lines on the mat for measuring or aligning the fabric. Your ruler has precise printed lines. The lines on your cutting mat aren’t nearly as accurate. If you find that the lines on the mat are distracting, turn it over. Most self-healing mats are double sided for cutting, one side with lines and one side without. 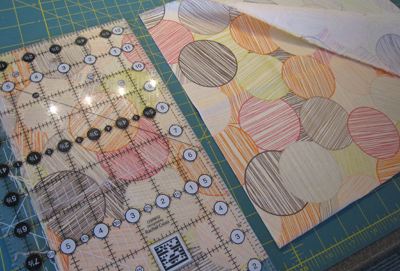 Select one of your print fat quarters that will be the large block center. Fold the fabric in half with the selvage edge of the fabric (for my fabric the selvage is a little fuzzy, often the selvage has words or color dots along the edge) at the top or further away from you and the fold is at the bottom, closer to you. 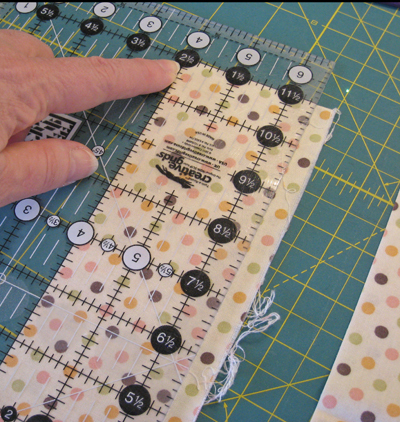 Place your ruler on top of the fabric and line up the fabric fold (at the bottom) with one of the horizontal ruler lines. . . .
. . . 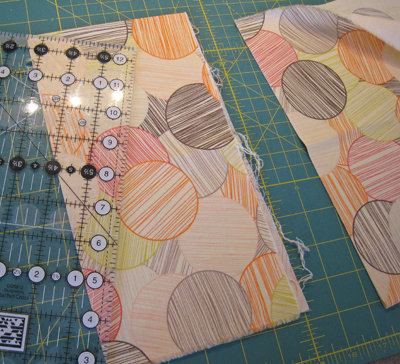 The first cut will be a little more than 5″ away from the edge of the fabric. This is where I differ a bit with the cutting post referenced earlier. Rather than juggle two or three rulers, one ruler will do the trick! 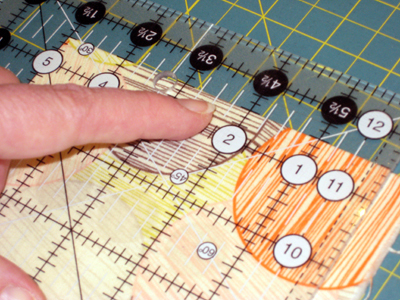 Place your palm on the ruler, and apply pressure from your upper arm (not your finger tips) to hold the ruler steady. . . . Another difference here from the referenced cutting post. Putting all that pressure on your finger tips can make your hands very tired for longer cutting sessions. Tired finger tips don’t hold the ruler as well, ruler slips, and all that cutting accuracy goes out the window. However, I completely agree that it’s important to keep your finger tips away from the ruler edge. Always respect your rotary cutter, it is sharp! Keep it in closed and locked position when it’s not in use. “Palming” the ruler may take a bit to get used to, but it’s one of those good habits to develop from the get-go. Important: Cut from your tummy away. Never cut toward you. 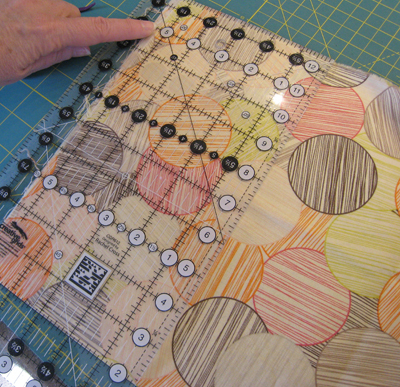 There are very few ‘nevers’ in quilting, but this is one of them! It bears repeating: Apply consistent firm pressure along the ruler edge. One firm, even stroke is all you need, no back-and-forth strokes. 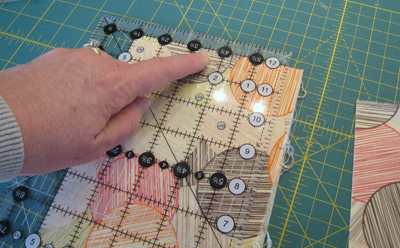 Before you move the ruler, pull the fabric away to the right to make sure your cut is complete, top to bottom. 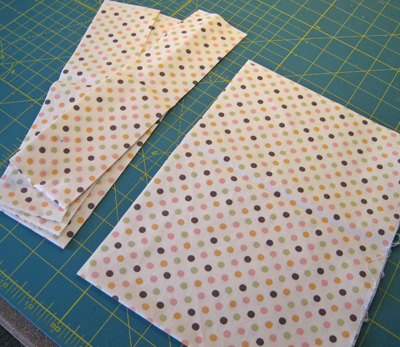 Next, carefully rotate the fabric on the left (the part that is a little more than 5″ wide that you just cut off) 180˚ so the fold is now on top. 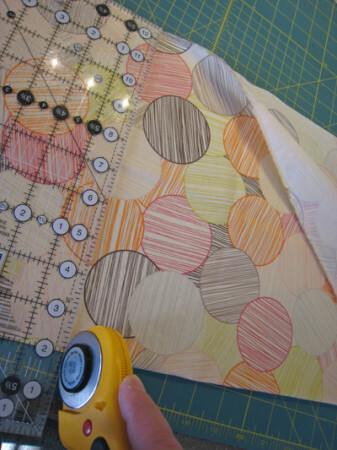 Try not to disturb the layers as you rotate the fabric piece. Notice, this time, I have aligned one of the horizontal ruler lines (doesn’t matter which one) with the fold that is now at the top. Now make another nice firm cut along the right edge of the ruler. You now have a 5×21′ strip. . .YAY! 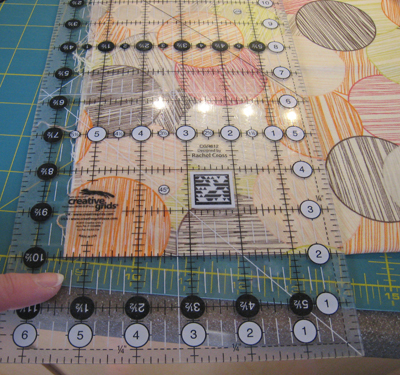 Or it should be 5 x 21″ the length (20-21″) of the strip may vary some – depends on the fabric manufacturer, depends on how it was cut at the quilt shop. So it’s important to cut carefully, sometimes you don’t have very much leeway. 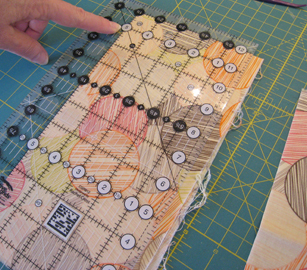 Without disturbing the fabric layers, rotate the freshly cut strip 90˚ so the raw edge is to the left. 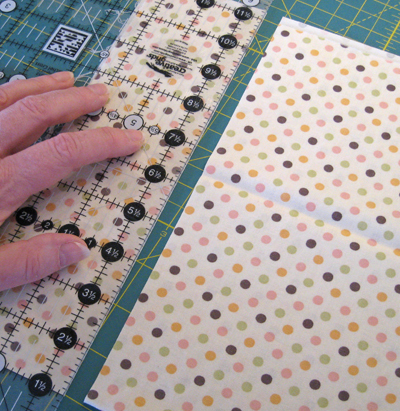 . .
Align the ruler so the left edge of the fabric is a little more than the 5″ mark on the ruler. You can’t see it on this photo, but I have also aligned the top and bottom of the strip (the two fresh cuts on either side of the strip) so they fall right on two horizontal ruler lines, each exactly 5″ away from the other. 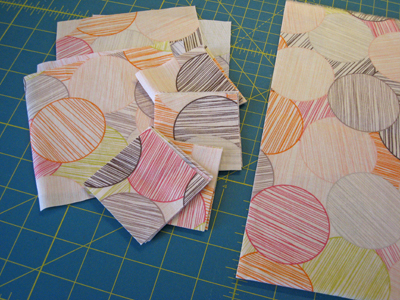 Rotate your first pieces 180˚and set them aside for one quick second. Another firm cut through both layers of fabric. Now you have four layers one with a fold to the right, and one with the raw edges to the right. Stack up the four layers, so the edge on the left and the top and bottom are all lined up. 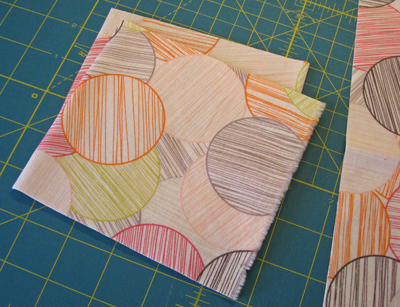 Align the two stacks, now four layers, and cut four 5″ squares. Cut through all layers . . . Again, tummy and away, one firm slice. Remember to “palm” the ruler to hold it steady. 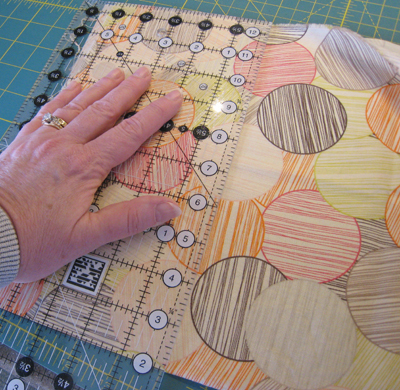 Four 5″ squares for the center of your blocks . . Yay! 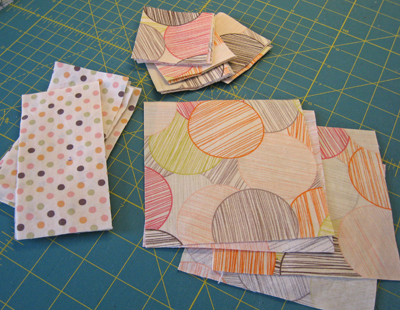 To make the corners of your blocks, cut two more strips from this fat quarter (or select another fat quarter). 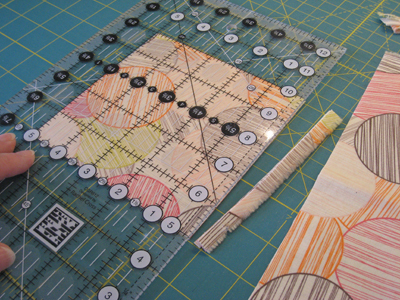 Cut these strips be 2-1/2″ wide, just like before, except you can use the fresh-cut fabric edge to align with the 2-1/2″ ruler line. And skip the step where you flip the strip for the second cut. 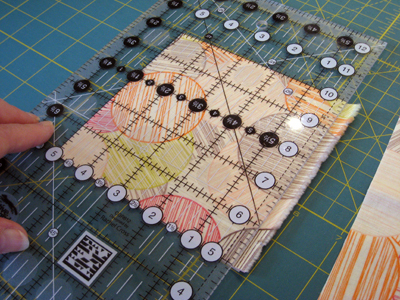 Rotate the strip 90˚, then cut sixteen 2-1/2″ squares for your block corners. 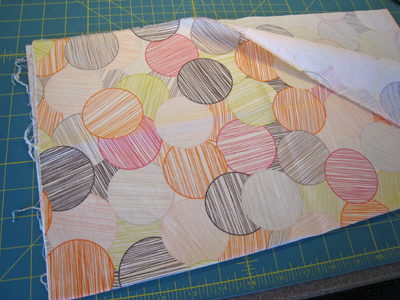 Chose your contrasting fabric, in my case I have a smaller dot print. In your case, Karen, I think you can choose one of your white fat quarters. Follow the process as above to cut two 2-1/2″ strips. True up the messy edge like we did for the 5″ strip. Start with a strip that is a little more than you need, flip it carefully, then true up the strip to 2-1/2″ wide. Notice that I have also flipped the ruler. 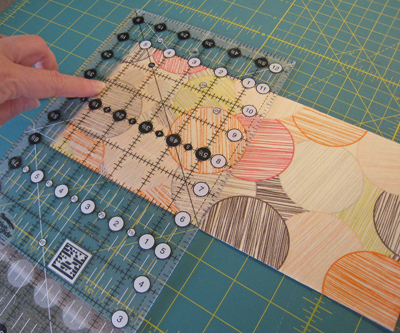 My Creative Grids ruler is 6-1/2″ wide, so one side starts with whole inch measurements (indicated by the markings in the white dots) and the other side starts with half-inch markings (indicated by the markings in the black dots). You’ll need four 2-1/2×21″ strips. 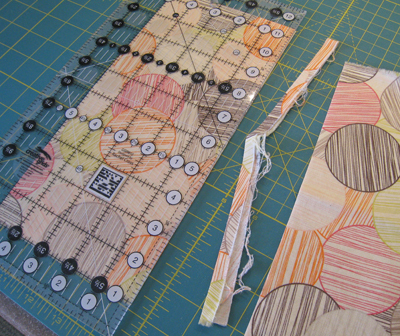 In my case, my fabric was only slightly longer than 20″ long, so I needed a few extra strips to cut the sixteen 2-1/2×5″ rectangles in need to make four blocks. 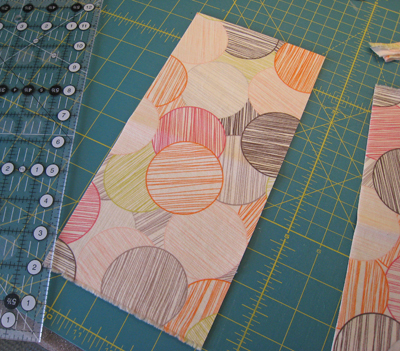 Fortunately, I had enough fabric to cut a few more strips. So, there you have it. 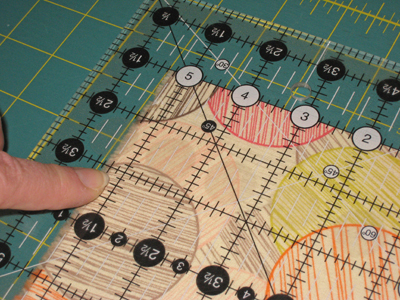 I cut four 5″ squares, sixteen 2-1/2″ squares, and sixteen 2-1/2×5″ rectangles. Keep in mind, if you are using different fabrics for your blocks or if you are making more blocks, for every block you are planning to make for your quilt, you will need one 5″ square for the center, four 2-1/2″ squares for the corners, and four 2-1/2×5″ rectangles for the block sides. Good luck! Ask questions if you have them. . . .